VyprVPN for iOS is now optimized for your iPad! Golden Frog developed the latest version with iPad design features in mind to give Giganews members the best experience possible when running VyprVPN on their iPad. VyprVPN for iOS will automatically detect if you are on an iPad and engage the new interactive Map View feature. With Map View, you can easily browse Golden Frog's global VPN server locations from the app default screen in both portrait and landscape view. You now have the ability to search for server locations by swiping directly on the interactive map. You can also select the location you would like to connect to and the app will automatically ping the server and display the ping time. Connect to any VyprVPN server location without ever leaving the home screen! If you currently use VyprVPN for iOS, update your app to the latest version. If you don't already have the app, you can download VyprVPN for iOS from the App Store. If you don't have VyprVPN and want protection for your internet connection while at home or on the go, upgrade to Diamond or Platinum get VyprVPN included for free! If you're not already a Giganews member, we invite you to sign up for a 14-day free trial. To stay up to date on VyprVPN, please subscribe to our blog and follow us on Giganews Facebook, Giganews Twitter,Giganews YouTube Channel, and Giganews Google+. VyprVPN Mobile Apps Now Available for Giganews Members! The Golden Frog team just announced the release of the VyprVPN Mobile Apps for Android and iOS devices. 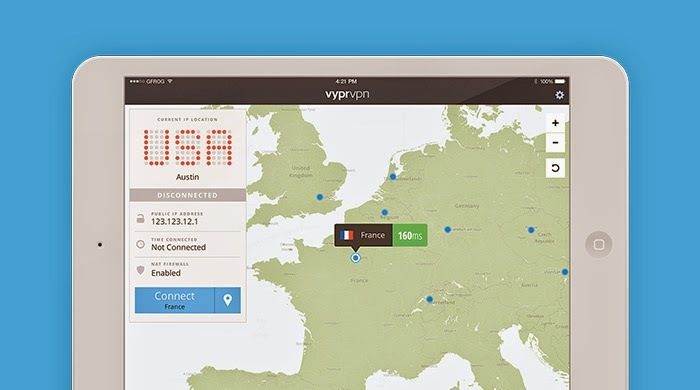 VyprVPN Mobile Apps are FREE for Giganews members with VyprVPN service! VyprVPN on Demand automatically initiates a VyprVPN connection whenever it detects Internet activity on your iPhone or iPad. The app enables VyprVPN when you need it and disables it when you don’t. After a one-time setup, VyprVPN on Demand will automatically encrypt your mobile Internet connection to secure your information and privacy. Download VyprVPN on Demand from the App Store today! VyprVPN for Android allows you connect to any of Golden Frog’s global VyprVPN server locations using a single tap to encrypt your internet connection. You can now skip the manual setup on your Android device and simply download VyprVPN for Android to quickly connect to VyprVPN. Download VyprVPN for Android from Google Play today! VyprVPN Mobile Apps are free to download but require VyprVPN service. Either sign up for a Giganews Diamond Membership, which includes VyprVPN for free, or add VyprVPN to your existing Giganews membership. To stay up to date with the VyprVPN Mobile Apps for Android and iOS, please subscribe to our blog and follow us on Giganews Facebook, Giganews Twitter, Giganews YouTube Channel, and Giganews Google+. Giganews® and the Giganews logo are registered trademarks of Giganews, Inc. ©2019 Giganews, Inc.